Try as he might Schad Richea wasn’t able to save the Flames season. However, the Flames assistant athletic therapist was able to make sure the show went on at the Dome Friday night. In the midst of Fleetwood Mac’s stirring performance at the Saddledome leading lady Stevie Nicks paused between songs to explain a recent fall had left her hobbling to the point she wasn’t sure if she was going to be able to continue on as part of the iconic band’s latest tour. 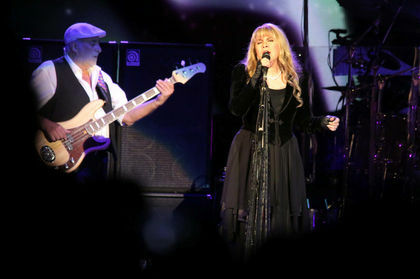 “It was, like, really bad,” the 64-year-old Nicks told the sold out crowd of her knee injury. Richea was given tickets to the show by Nicks and was shocked to hear his latest patient rain praise upon him for his efforts. “I was flattered — I wasn’t expecting anything like that,” said Richea. Richea said he just happened to be at the Dome when a call came from someone asking if he could help the legendary singer. “What I did was no different than what 140 other athletic therapists in Alberta would have done for her – I just happened,” said Richea, 39, a former Dinos and Toronto Blue Jays athletic therapist who has been with the Flames four years. Richea, a huge fan of live music, said the he thought the show was phenomenal. “Everyone was standing — I haven’t seen anything like that at the Dome since Kipper’s last game,” said Richea, who also took Nicks up on her invitation to see her after the show to meet the rest of the band. The aging band is in the middle of a rigorous 48-date North American tour that features shows almost every second night over the course of three months. To put that into perspective the Flames lineup of 20-and-30-something athletes also played 48 times in a three-month schedule with the help of a massive support staff that includes Richea and colleague Morris Boyer, who recently worked for Team Canada at the World Championships in Sweden. The NHL team only travels for half its games unlike rock bands, which play all their gigs on the road. “A lot of bands like Bon Jovi have chiropractors and physiotherapists travelling with them because the schedules and the job are demanding and they’re not athletes,” said Richea. After a one-month summer break Fleetwood Mac will resume rocking in Europe where they have another 19-city schedule set up. So glad he was able to help Stevie feel better. I am 55 and girl we just don't bounce as good as we used to. I have severe arthritis in my right knee, bone on bone, so I feel your pain. Plus ruptured a disk in my back the last time I fell. But it still did not stop me from seeing the classy lady in Little Rock, AR, even if I did have to go by myself. Rest it as much as possible. Praying for you. i wish I was that therapists what a dream come true if it was me. to do something like that too her, i guess it would be more that i met her and all i would ask for is a big huge and picture taken with her and maybe a peck on her cheek. I had noticed her limping when they were in Saskatoon, happy he could help Stevie so that others don't miss the fantastic concert! Schad Richea is the bee's knees in athletic therapy. Stevie was born on 5/26/'48. She's not 64 just yet. ^^^ She IS 64, and she'll be 65 this month.